Crayon has been an Interior Design firm since 1985. I remember most of the projects we have worked on and can say that most of the time as we see the project come to reality, it meets my expectations. Being able to envision a space and move it around in your imagination is a trait of all good designers. It’s like having virtual walk through software built into your head. Then there are times that a project blows me away. That the reality of the project exceeds the expectations I had of it and how I thought it would turn out. After 30 years, I still get really excited when I stand on a construction site and start to see the ideas come to reality. It is humbling to realize that these ideas we had, coupled with the trust and faith of our clients will take tangible shape and become reality. Actually, at times it is terrifying. But I trust my ability and more importantly I trust that we have done our work well and we have listened to the client and created something they will love. 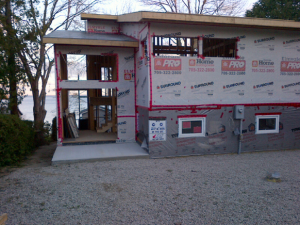 Our Ugly Duckling cottage renovation project blew me away when I stood on site and looked up at it from the lake side. IT WAS SO EXCITING!! The house had taken on such a huge presence from the lake side. The main floor windows soar upwards of 16’ high above the floor level. The lookouts on the roofline give this really neat lid to the house which is well proportioned to the mass of the building. The deck is not on the house yet, and the lower level doors are the original doors which will be replaced soon. 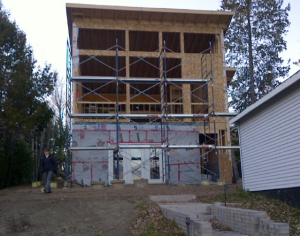 The scaffolding will stay in place until the windows are installed, which happens shortly. From the road side, the house is also transforming. Gone are the two tiny windows which looked like tiny eyes on a big wall. Gone is the solid vertical mass which was flat and boring. Now the house has a character that is much more approachable. The flat wall has been broken down into more surfaces on different planes and the roof line has been lowered on the road side, which disguises the height and scales the house to be in keeping with the neighbouring properties. What’s really cool about working on large cottage renovations is being able to make the house look understated from the road. It is something we consciously consider as we develop a new design. Years ago, a friend of mine in advertising told me about this concept that Walt Disney used for his theme parks. It was something like “don’t give away the whole show as soon as you walk through the gates” (very paraphrased). The idea being that a space should unfold as you enter it. That you can see a glimpse of something interesting when you enter but keep some surprises for later on. I like that concept and I try to employ it as much as possible for projects. I am aware of the transition from public to private spaces, from road view (public) to intimate (private) spaces. That we make the best spaces possible for our clients to use rather than trying to impress from the road and look ostentatious.